After attracting over 25 million players during the Beta phase, Paladins: Champions of the Realm officially launches on May 8th on PC/Xbox One/Playstation 4, Hirez announced today. The most played game on Steam in 2016, its still regularly among the top 20 most-played on daily steam charts, as well as one of the top free-to-play on both consoles. It has evolved into a popular esport on both platforms, and the Paladins Premier League features 10 Worlds Esports Association (WESA) organizations. As part of its two-week launch celebration, beginning today, May 2, Hirez Studios is giving away up to 100 million in their in-game currency. The Paladins Launch Celebration will also feature an esports tournament at the Esports Arena Las Vegas, as well as a host of in-game and community activities. Esports Arena Las Vegas will host the Paladins launch tournament, Esports Superstars: Paladins, on May 5 and 6. The tournament, presented by Allied Esports, will feature 6 of the world’s best Paladins teams facing off on the Las Vegas Strip for a total prize pool of $100,000. Anyone who has played Paladins during the Beta will receive 200 Crystals free if they log in from May 8th-31st, and Players still have until May 8 to start playing and become eligible for this giveaway. All Champions will be unlocked from May 2nd-7th, so now is the best time to get started and try some new champions. 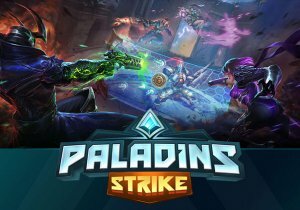 Hirez also added to this celebration with the global release of Paladins Strike, their mobile shooter set in the Paladins universe. It’s available for both iOS and Android for free. By playing Paladins Strike, players can unlock two free skins in Paladins: Champions of the Realm. Webzen has announced the beginning of Task Force 613, the first closed beta test for Arctic Combat.